PUEBLO – The Music Department at Colorado State University-Pueblo will open the Spring 2017 Semester with a Grammy Award-winning vocal group dedicated to mining the expressive potential of the human voice. Their appearance is possible in part through the Office of Student Engagement and Leadership. A Roomful of Teeth will entertain attendees beginning at 7 p.m. on Thursday, Jan. 19 in Hoag Recital Hall. Through study with masters from singing traditions the world over, Roomful of Teeth, an eight-voice ensemble, continually expands its vocabulary of singing techniques and, through an ongoing commissioning process, forges a new repertoire without borders. Founded in 2009 by Brad Wells, the band gathers annually at the Massachusetts Museum of Contemporary Art (MASS MoCA) in North Adams, Mass., where they’ve studied Tuvan throat singing, yodeling, belting, Inuit throat singing, Korean P’ansori, Georgian singing, Sardinian cantu a tenore, Hindustani music and Persian classical singing with some of the world’s top performers and teachers. Commissioned composers include Rinde Eckert, Judd Greenstein, Caleb Burhans, Merrill Garbus (of tUnE-yArDs), William Brittelle, Anna Clyne, Fred Hersh, Wally Gunn, Sarah Kirkland Snider, Missy Mazzoli, Michael Harrison, Sam Amidon Julia Wolfe and Ted Hearne. The project’s self-titled debut album was released in October 2012 on New Amsterdam Records. Called “sensually stunning” by the New York Times, the album was included on many Best of 2012 lists, topped the classical charts on iTunes and Amazon, broke into the top 10 on the Billboard charts and took home a Grammy Award in 2014 for Best Chamber Music/Small Ensemble Performance. In April, 2013, ensemble member Caroline Shaw received the Pulitzer Prize in Music for Partita for 8 Voices, the four movements of which appear on the Roomful of Teeth’s debut album. 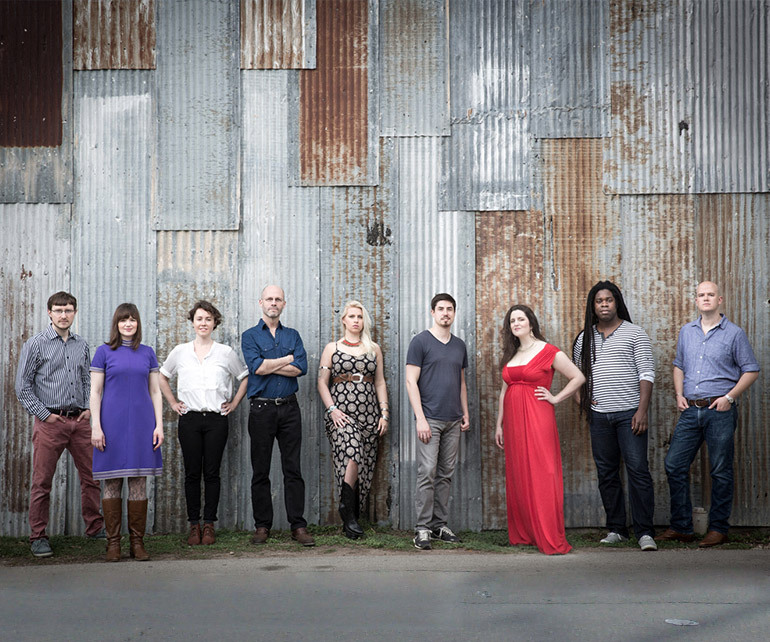 Composed over three summers from 2009-2011, in collaboration with Roomful of Teeth during their residencies at the Massachusetts Museum of Contemporary Art (MASS MoCA), Caroline Shaw’s Partita for 8 Voices was nominated for a Grammy for Best Contemporary Classical Composition and received the 2013 Pulitzer Prize in Music. It is the only Pulitzer awarded to an a cappella vocal work, and Shaw, a singer in the ensemble, is the youngest composer ever to have received the prize. An iTunes exclusive EP of Partita was subsequently released and ranked no. 1 on iTunes classical charts. Roomful of Teeth’s sophomore album, Render, was released April 2015 on New Amsterdam Records. Dubbed “both beautiful and groovy as hell” (The Thoroughfare), the album features debut recordings of works by William Brittelle, Caleb Burhans, ensemble tenor Eric Dudley, Wally Gunn, Missy Mazzoli and artistic director Brad Wells.